All clients on IAND have the opportunity to import ERP data to get project and supplier level insights on spend and risk. Find out how to import your supplier spend data onto the IAND platform. The order in which you include the data, needs to follow our set column structure. Please review the sample file. Populate your file based on data from the last 12 months. We recommend including the last full month for which you know spend information. If you have any questions, contact support@iand.com. Your account manager will upload your first file. This is to ensure we can carry out quality testing to review your column structure. As soon as the file is checked, we will upload it and your data will be visible on your account. 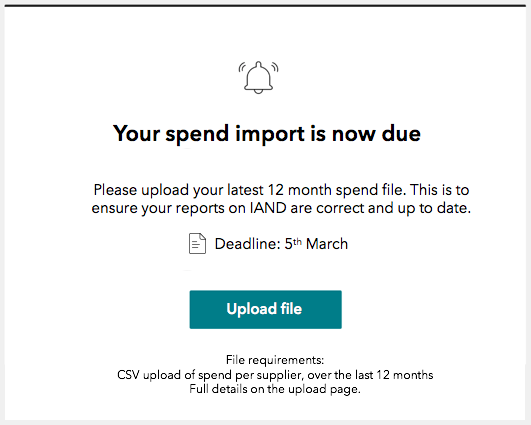 For on-going uploads, IAND will send your dedicated contact person a monthly email, to remind you that monthly spend imports are due. IAND allows you to import financial information, to maximise the reporting capabilities that IAND offers. We then tie in your spend, with performance, risk information and more. Importing your spend is easy. All that is required is a CSV file import.